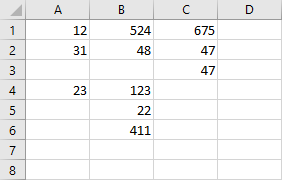 In order to count rows in Excel, you have to use VBA code. Open VBA Editor with Alt + F11. Here, we will return the last cell with the selected column A. The following code is going to return 4 because A4 is the last cell in column A. This code is a bit different. It’s going to return 6 because B6 is the last row in all columns (entire sheet). The following code is the safest as it takes into consideration previously deleted cells.